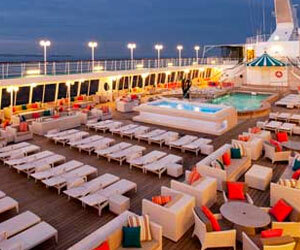 The Crystal Symphony is one of the most luxurious and spacious cruise ships at sea. With eight passenger decks and catering for 922 guests, this beautifully appointed cruiseliner is able to offer each person on board a personalised service with enough space to relax without feeling crowded. The public areas are large and splendid, furnished with the highest quality fixtures and fittings and also the wonderful spacious teak promenades offer some of the best walks and vistas at sea. 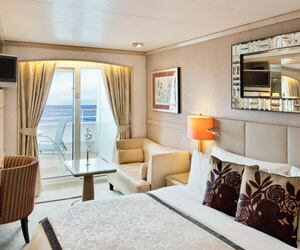 The private spaces on board the Crystal Symphony are impressive and sumptuous, many benefiting from a private verandah. By night, the Crystal Symphony is full of life, with a variety of entertainment on offer. With our signature focus on choice, the Crystal Dining Room now offers two menus each evening: an innovative new “Modern” menu including dishes such as a Slow-cooked Shiraz-braised Oxtail Ragout, or a re-imagined Strawberries Romanoff with Cotton Candy dome, alongside a “Classic” menu of traditional favourites. NOTE: You may reserve your dining times via our Priority Check-in & Planning Center (PCPC) prior to your cruise, or you may make arrangements once on board. All dinner reservations are subject to availability, and every effort is made to honour requests. Perfect Choice Dining, a unique concept offered in the Crystal Dining Room, allows you to choose Classic Main (seated at 6:15pm), Late Seating (seated at 8:30pm), or Dining by Reservation (when and with whom you wish) for your evening dining. Our complimentary Dining by Reservation affords you ultimate freedom, inviting you to dine at a different time, at a different table, just for two or with newfound friends. This option can be selected at the time of booking. Once your cruise is fully paid, you may then reserve your personal dining times at our Priority Check-in & Planning Center (PCPC). As many traditional cruisers prefer classic dining options that allow them to dine at the same time each evening during their cruise – at the same table with their regular table-mates and served by their familiar evening wait staff – we are pleased to continue offering our Classic Main and Late Seatings, too. Breakfast and lunch in the Crystal Dining Room are open seating. Crystal specialty restaurants provide an opportunity for guests to enjoy a variety of culinary experiences. In order to ensure that each guest has a chance to dine at Prego, Silk Road and the Sushi Bar at least once during their voyage, a maximum of one reservation per specialty restaurant will be confirmed per booking via our Guest Check-in/Priority Check-in and Planning Center (PCPC). All additional reservations or visits (i.e. walk-in dining) will be confirmed on board on a space available basis for a nominal fee of $30 per person, per dining experience. Dining Reservation: Guest Check-in, Priority Check-in and Planning Center (PCPC) will only allow ONE reservation in each specialty restaurant, per booking, per guest, prior to the voyage. Additional reservations will be confirmed on board for a nominal $30 reservation fee, may only be confirmed on board and are subject to availability. Note: Sushi Bar is not available for pre-reservation via PCPC. Sushi Bar seating/dining requests must be made on board the ship, on a first-come, first-served basis, based on space availability. Once on board, if a guest chooses to dine again in one of the specialty restaurants he/she will be accommodated on a first-come, first-served reservation basis for a nominal fee of $30 per person, per dining experience. The same policy applies to guests who are accommodated as “walk-in” diners should space be available at time of dining request with the Maitre D’. Specialty restaurant dining reservations (excluding The Sushi Bar) made online via Guest Check-In/PCPC will require each guest’s Crystal Key code. For more information, click here. • Guests on Back-to-Back Cruises: Guests sailing on multiple voyages will receive a complimentary reservation on each voyage. For example, a guest sailing on a 27-day back-to-back cruise of 3 segments (7 days + 9 days +11 days) will receive 1 (one) complimentary reservation in each restaurant on each voyage, for a total of 3 complimentary reservations (i.e. 6 dining experiences: 3 in Prego and 3 in Silk Road/The Sushi Bar) per booking, per guest. • Guests on Cruises 14 days or longer: Guests will be extended 2 (two) complimentary reservations in each Specialty Restaurant. The second reservation will need to be made and confirmed on board the ship, once the sailing begins and is on a space available basis. Full World Cruise Guests: All Specialty Restaurant reservation fees will be waived. One reservation per Specialty Restaurant, per World Cruise segment may be booked via PCPC prior to the voyage. 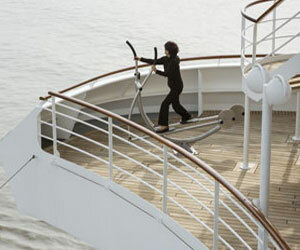 Additional reservations will need to be confirmed on board the ship, after the voyage begins. • Guests redeeming their 50+ Milestone Crystal Society Benefit: All Specialty Restaurant reservation fees will be waived for all guests who have achieved their 50th Crystal Society Milestone. This is a NEW Crystal Society benefit. Again, 1 (one) reservation per Specialty Restaurant, per segment may be booked via PCPC prior to the beginning of each voyage. 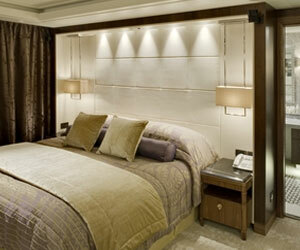 Additional reservations may be confirmed when on board the ship, on a space available basis. 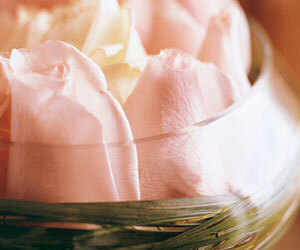 Charming and romantic, Prego brings the flavors of Italy to Crystal Symphony and Crystal Serenity. Savor intimate table side service and a seasonally changing menu of traditional favorites such as Scaloppine Di Vitello Servite Con Capelli D’angelo and Linguine Con Aragosta E Zucchini. Serving dinner only. To pre-reserve a seating or private dinner, please visit our Priority Check-in & Planning Centre. Please note that the date of your Vintage Room dinner will be determined closer to sailing date as a minimum of 10 guests must confirm participation for the event to be offered. Serving dinner only. Ultimate Vintage Room Dinners – Crystal’s Ultimate Vintage Room Dinners are one-of-a-kind culinary experiences featuring some of the rarest wines in the world. Offered a few times each year on both Crystal Serenity and Crystal Symphony, depending on the wines selected the exceptional dinners are priced at an estimated $1,000 per person.The first Ultimate Vintage Room Dinner was an eight-course French meal prepared by Master Chef André Soltner, former chef/owner of world-famous Lutèce, paired with, among others, a nearly impossible-to-get 1959 Chateau Lafite–Rothschild, Pauillac, Bordeaux and a Screaming Eagle 1996 from Napa Valley, considered its dream year. This is a buffet-style, indoor/outdoor venue for breakfast and lunch. Breakfast includes made-to-order omelets, waffles and pancakes to your liking, in addition to a large selection of other breakfast favorites. Lunch offers made-to-order pastas and salads, a delicious selection of our famous soups, carved meats, fresh catches of the day and a tempting array of sumptuous desserts, including sugar-free options. 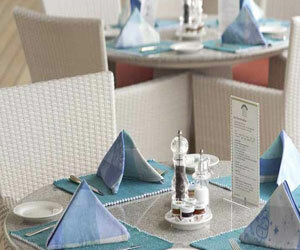 Lido Café is also the venue for afternoon Theme Buffets, as well as dinner on select evenings (Crystal Symphony). Dress is casual. Reservations are not required. This popular European-style coffee bar and café is a favorite meeting place open every day from 9am to 11pm. Complimentary espresso, caffe latte, cappuccino and specialty teas are served in our comfortable café, graced by the whimsical paintings of celebrated artist Guy Buffet. Mid-ship dining spaces on Lido deck are all new and redesigned for a more open, casual and relaxed dining experience including the Trident Grill which offers classic hamburgers, cheeseburgers, veggie burgers, chicken burgers, hot dogs, tuna melts, wrap sandwiches and gourmet pizzas. A Late-Risers Breakfast is available in the redesigned Tastes Bar & Restaurant (Crystal Serenity). And for a special cold treat, Scoops ice cream bar features a wide variety of Ben & Jerry’s ice creams, plus, nonfat frozen yogurt and sherbets, with tempting toppings, and fresh baked cookies. In addition to a convenient Late-Risers breakfast and Global Comfort foods at lunch, each evening Crystal Serenity’s Tastes offers a unique Globally inspired dinner menu serving an eclectic variety of family-style dishes—from a savory Alsatian Tarte to a trio of California Street Tacos, Ahi Tuna Poke, Gambas a la Plancha and much more. Desserts are equally delectable such as a Dark Chocolate Crème with marshmallow fluff and toasted almonds. A selection of premium wines is also available by the glass or by the bottle. Dress is casual. Reservations are required for dinner only. Serving a Late-Risers breakfast, lunch and dinner. From breakfast in bed to dinner on your verandah, Crystal’s complimentary 24-hour in-stateroom dining is a true indulgence. At sea or in port, you may enjoy breakfast, lunch or dinner in the sumptuous comfort of your own room, served with the same precision and attention to detail so graciously displayed in every restaurant. During lunch and dinner hours, you are welcome to order the same selections offered in the Crystal Dining Room, served course by course, if you so desire. And if you’re traveling in a Penthouse, you may also enjoy the additional privilege of ordering from our specialty restaurants during dinner hours. Offered 24 hours a day, seven days a week. With some of the most exotic destinations and stunning coastlines in the world as a backdrop, lavishly arranged luncheon buffets take place on the Lido Café on select days at sea. 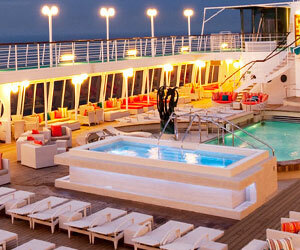 Imagine cruising the Italian Riviera as you dine on the Mediterranean-themed Cuisines of the Sun. Think Nuevo Latino celebrating the fiery gastronomy of South America, or an Asian Café showcasing flavors of the Pacific Rim. Regardless of where you travel, these events are always much more than a meal-they are true gastronomic celebrations of extraordinary cultures around the world. Serving lunch on select days at sea. A wide choice of pre-packaged kosher-certified meals, including meats, seafood and poultry as well as white and red kosher wines is available on a limited basis, on every itinerary. All chefs, kitchen and dining staff have been trained in kosher food preparation, handling and servicing. Only kosher pots, pans and utensils are used, and plates, silverware and glassware are washed separately. Due to limited provisioning resources, the number of guests per cruise who may partake in our kosher-style program is restricted to 20. Guests’ whose diet requires or who wish to dine kosher-style must provide us with advance notice at the time of the initial reservation, and no less than 90 days prior to sailing. We will do all that we can. • Thermage® CPT – the premier non-invasive skin tightening therapy, utilizing radio frequency to improve the appearance of loose or sagging skin on the face, neck and abdominal region. Crystal® has long been renowned for our lavish entertainment, with large-scale productions uniting West End and Broadway, intimate lounges, cabarets and karaoke, and dance clubs for disco and hip-hop. In virtually every industry poll, Crystal Cruises® ranks number one for our exceptional entertainment. With the most diverse activity and entertainment programs afloat, even the most discerning theatre-goers, concert-lovers and dance aficionados will appreciate the musical styles that range from nostalgic and classical to popular and contemporary. 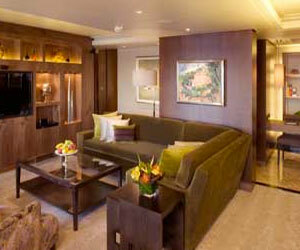 The all-inclusive Crystal Experience® adds a dash of joie de vivre to the variety of bars and lounges aboard our ships. 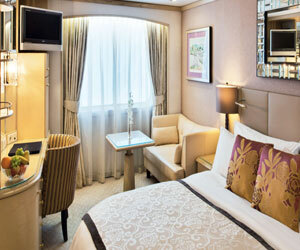 Each venue features a unique style and atmosphere as well as differing hours of service, with fine wines and premium spirits included in your cruise fare. 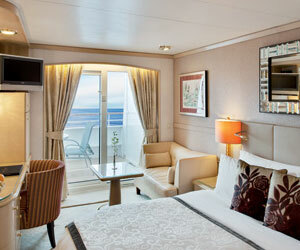 In addition, each stateroom is equipped with a refrigerator, stocked with complimentary bottled water and soft drinks. 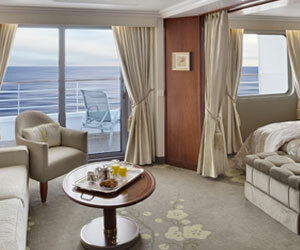 You may have alcoholic beverages delivered to your stateroom by calling Room Service. Wines and specialty spirits from our Connoisseur Menu will be charged to your shipboard account. Crystal’s signature cocktail and piano bar is known for its intimate “clubby” atmosphere on both Crystal Serenity® and Crystal Symphony®. Glittering and stylish with fabulous chandeliers and an air of energized excitement, Resorts World At Sea casino aboard our ships offer thrilling games of chance featuring Blackjack, Craps, Roulette, 3 Card Poker*, Ultimate Texas Hold’em* and Mini-Baccarat (on request), as well as slot and video poker machines. A casino shipboard advance of up to $300 per person, per day (up to a maximum of $3,000 per cruise), may be charged to your shipboard account. A line of credit may also be established prior to your cruise by completing an online application at the Priority Check-in & Planning Center. Click here for PCPC. To download a .pdf version of the application, click here . Please allow 2-3 weeks processing time prior to the start of the cruise. Please contact our Casino Coordinator at 310-203-4372 if any further assistance or information is required. All Shipboard Credits may be used in the Resorts World At Sea casino for bingo play. Guests will be able to withdraw up to $100 per cruise of shipboard credits at the casino cage in the form of non-cashable slot vouchers and/or non-cashable table game chips. Bingo purchases are applied to guest folio where SBC can be applied to Bingo charges. This SBC benefit, in addition to availability of SBC redemption in our onboard luxury boutiques, Specialty Restaurants, or on Crystal Adventure® shore excursions ensure your clients truly savor the Crystal Experience® just as they wish. Restrictions apply, see Casino-SBC FAQs for additional details. Resorts World At Sea casino patrons’ enjoyment is further enhanced with the convenience of Global Cash Access— a service that enables our guests to obtain cash advances using their credit or debit cards directly at the Casino Cage. The guests’ credit or debit cards must be presented to our cage personnel at the time of cash advance request. Cash advance limits will apply and are dependent on the guests’ personal daily allowable withdrawals as determined by the (card) issuing financial institution. A nominal fee will apply for using this service. • Guests must be at least 18 years of age to enter the gaming areas, or to play any monetary-based games of chance (including Bingo) on board. The Resorts World At Sea casino offers Nevada-style gaming and is subject to closure in various ports, with or without notice. Casino gaming services are available on all voyages aboard Crystal Serenity and Crystal Symphony; and on full-charter Crystal Esprit voyages (on request) only. Between Crystal Symphony and Crystal Serenity, our well-stocked Library contains over 8,000 books on subjects ranging from classics to popular biographies, history to contemporary mysteries. There is also an entertaining selection of over 2,000 DVD movie titles plus CDs, magazines, audio books and a generous selection of board games which may be borrowed without charge for your enjoyment during the cruise. 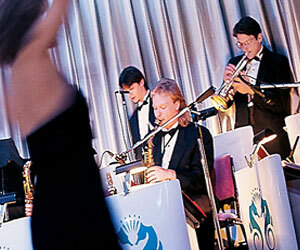 Dancing to live music is a nightly highlight aboard both Crystal Serenity and Crystal Symphony. Whether traveling alone or with others, we invite you to hone your skills at dance classes taught by award-winning international dancers. On every sailing, Crystal is pleased to offer a host program that includes carefully screened gentlemen with interests and backgrounds similar to those of our guests. Each distinguished Ambassador Host is cultured, well traveled and an accomplished ballroom dancer. The stars shine brightest at sea. Crystal Cruises is proud to feature exciting celebrity entertainers on board such as Carol Channing, Tommy Tune, Joel Grey, Maureen McGovern, Lorna Luft and John Davidson — among many others — all part of the diverse spectrum of entertainment options available to our guests. Categories P1 / P2 : Deluxe PURE® Staterooms with Verandah are allergy-friendly staterooms featuring a patented air purification system that creates a hypoallergenic environment. Available in categories P1 and P2. 202 sq. ft./18.7 sq. mt. 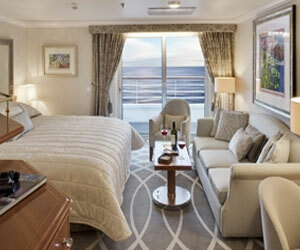 Come away with Silversea on a virtual voyage. Silversea Brochure 2016, Worldwide Voyages. Silversea 2017 Voyages and Expeditions Brochure.